Frustratingly that guy stopped just after I started taking that video! It seemed to really help keep the traffic moving, and made me ponder why more cities don’t do that during the morning rush hour! 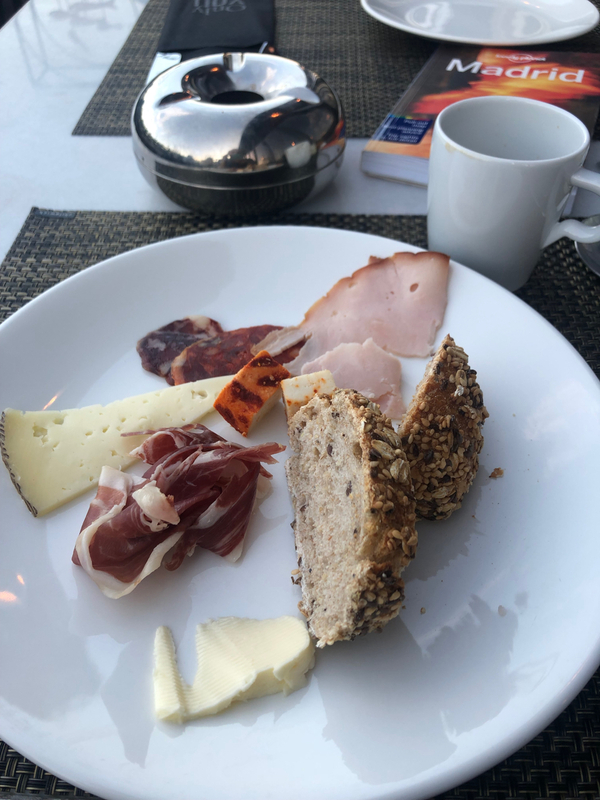 I stood for a while just watching the guy’s frantic arm movements and enjoying feeling the warm sun on my face, then took the hotel’s lift up to the seventh floor for a spot of breakfast. I’d pre-booked that the day before which saved me a couple of euros. As hotel breakfasts go, the buffet style set up was pretty good! There was a wide range of cold food and a fair few hot options as well. 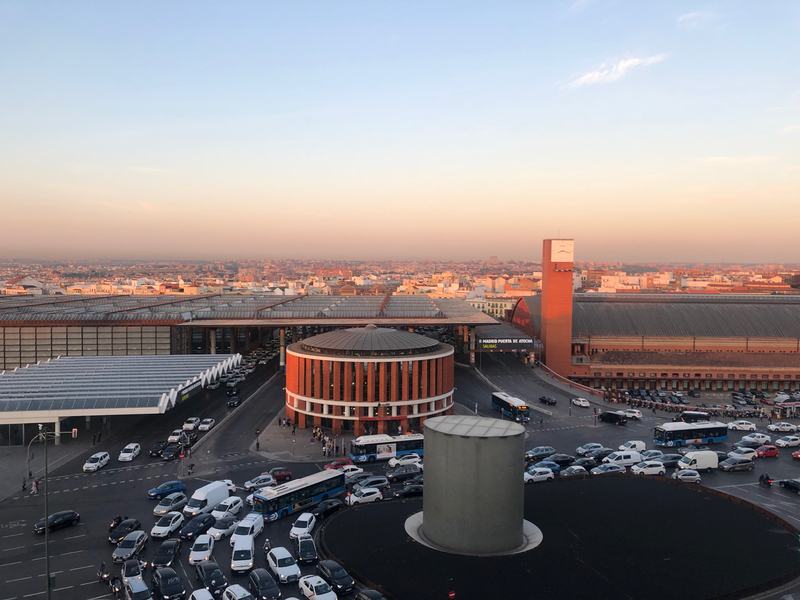 I grabbed a seat out on the balcony and looked out at the view – which was really just of Atocha train station…. Still not bad though! A waitress came and moved me as apparently I was sitting at a reserved table. Moving tables, I managed to stay on the terrace – just not at the street-side edge. There’s something just nice about eating al fresco. 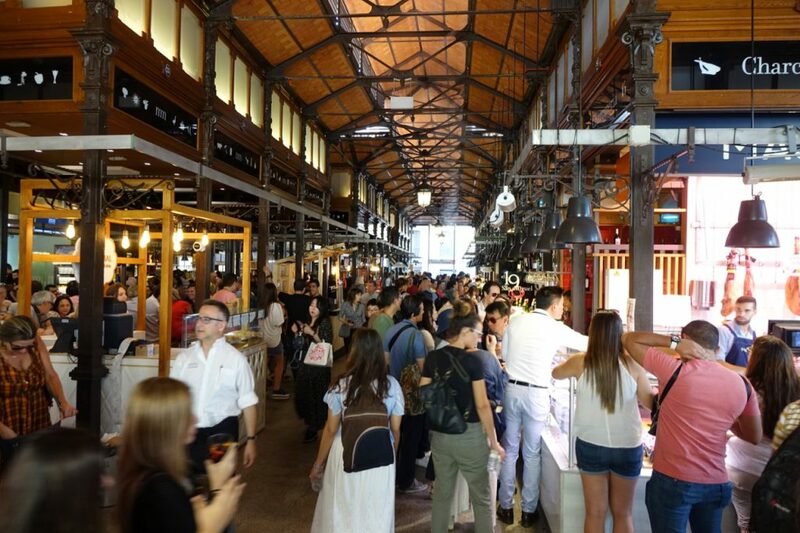 Next was a small selection of Spanish ham and cheese – the range of ham and meat on offer was pretty impressive! I think I got my money’s worth! After a quick trip back to the room I packed my bag and set off for my first appointment of the day. I leapt on the metro and took the number 3 line to the Ventura Rodriguez station, then had a ten minute walk. 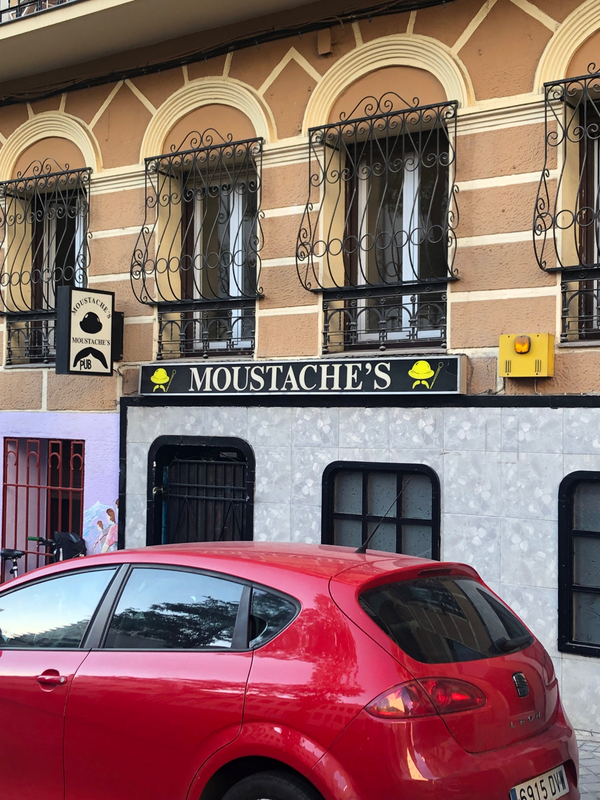 Finally I arrived at my destination – which was right next door to this brilliantly named bar (I’ll even excuse the misplaced apostrophe). 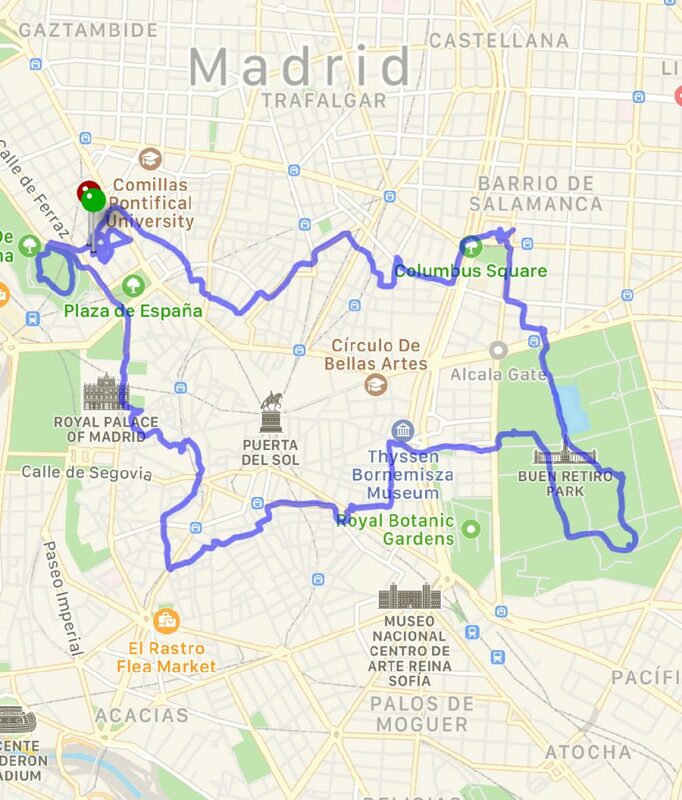 I’d booked a three hour bike tour with Bravo Bike Madrid. I’ve found that bike tours are a great way to get a quick handle on a new city. 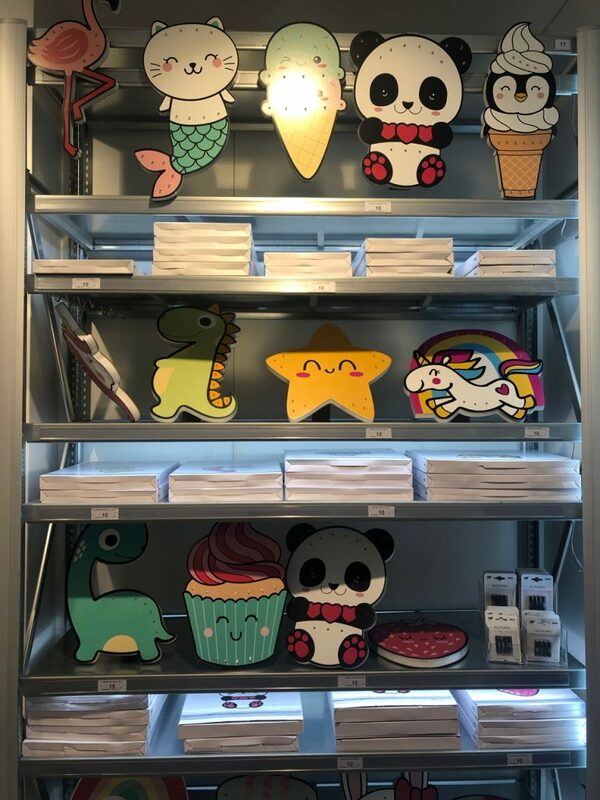 You get to explore parts of town which might be off the well-trodden tourist tracks plus you often spot things you want to come back and check out later on. I headed in to the small office next door to Moustache’s and met Sebastien who was to be our guide. Soon I was joined by a Canadian couple who had just arrived in the city and were on a three month tour of Spain, and a couple from Birmingham who had been out the night before and were hungover. I had a bit of sympathy for them! After checking the height of our saddles, Sebastien went over how to operate the gears (that went completely over my head – I just kept it in the same gear all the time). I also made a mental note not to use the front brake suddenly following my head-over-handlebars experience last year in Finland. And with that, we were off. 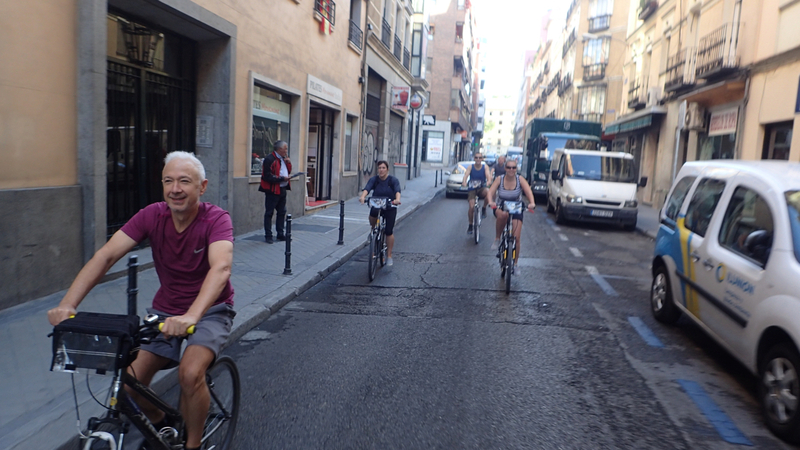 At a pretty quick pace too, as we headed down the narrow street. Sebastien had a small camera with him so managed to grab some action shots through the ride. I’m way at the back on this one! The temperature in the city was beginning to rise, but the benefit of being on a bike was a cool breeze that kept you at just the right temperature as you pedalled away. 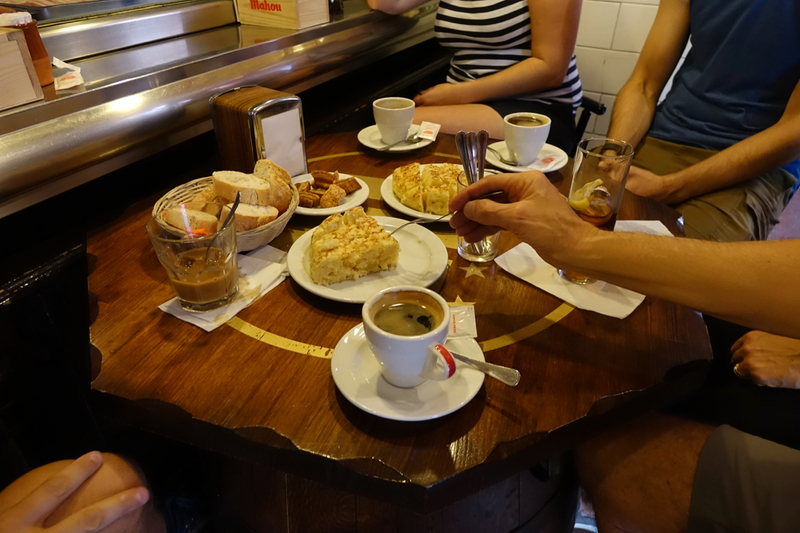 After navigating a six lane street, we were soon at our first stop – Parque de la Montaña. 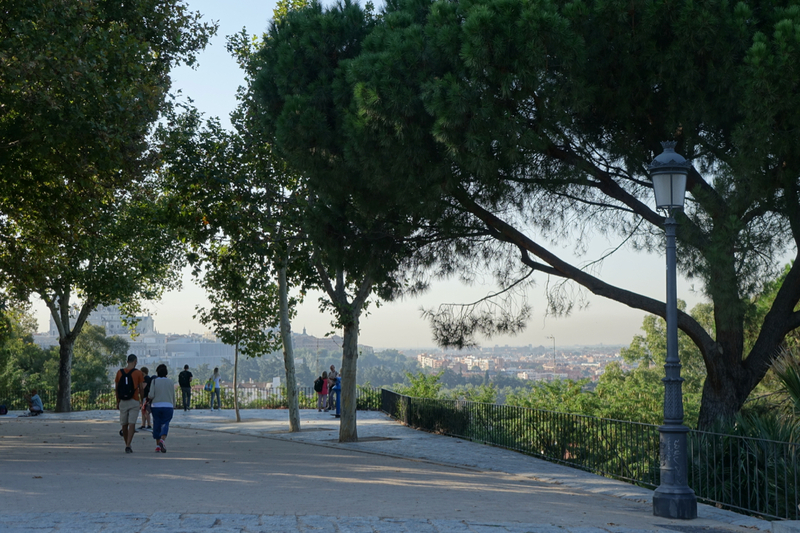 Madrid’s full of green spaces, and unlike at home, the city gets the weather for its inhabitants to be able to take advantage of them! 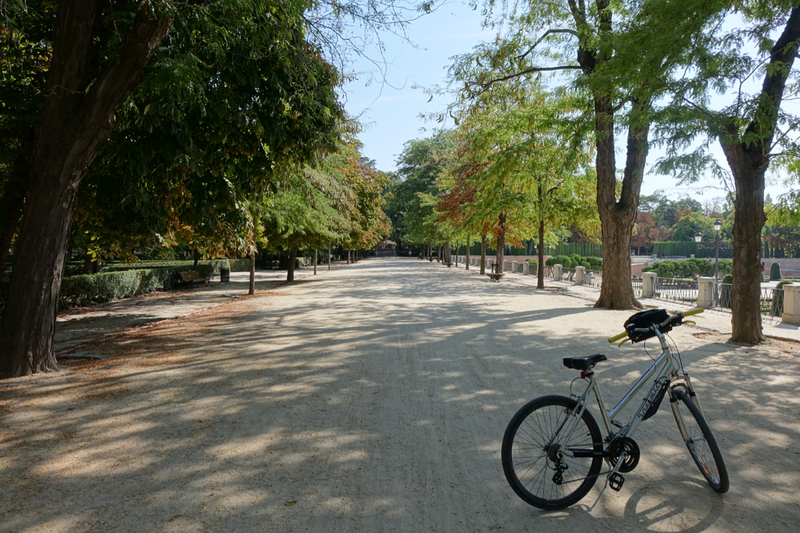 We stopped and took a couple of photos then cycled a short distance along a path until we came across the Temple of Debod. Dating back to 200BC (i.e. pretty old!) the temple was built – and originally situated – in Egypt. But in the last century, Egypt gifted the temple to the city of Madrid to help prevent it from flooding after the construction of a nearby dam. 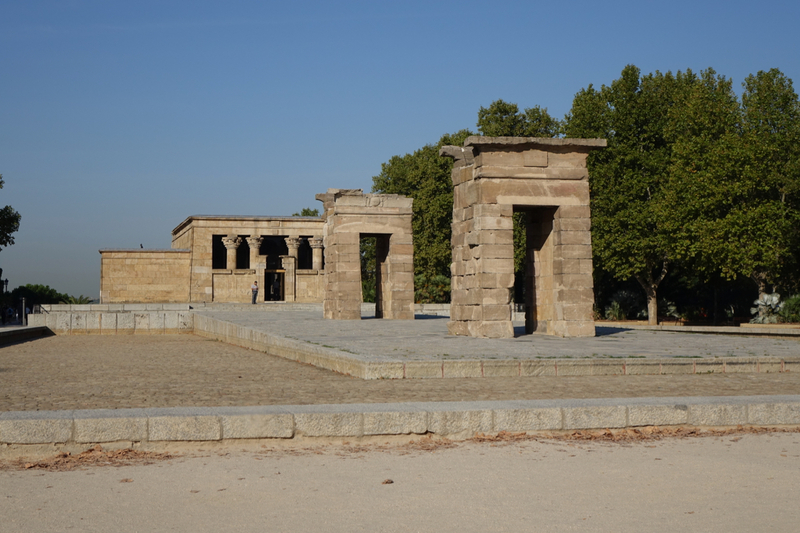 The whole temple was meticulously taken apart, sent to Madrid and then reconstructed in Parque de la Montaña. I think you can go inside, but we didn’t have time for that. Soon we were off again. Although I’m not on a bike very often, it really is true that you never forget how to ride one. I didn’t have a problem cycling at all – just the occasional wobble when setting off! Our next stop was the Royal Palace. 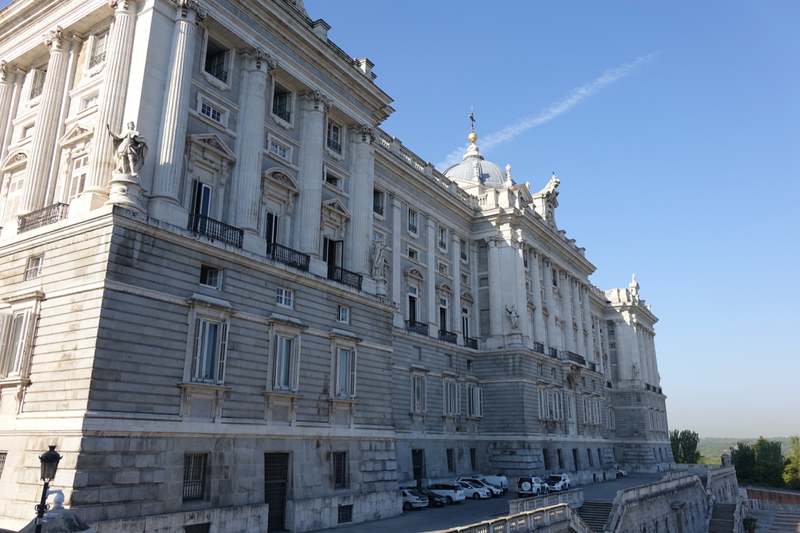 Although it’s not the Spanish Royal Family’s home any more, it is their official residence. Bigger than Buckingham Palace, it was quite a sight. There seemed to be some kind of stage being built outside it while we were there, but no-one knew what that was for. 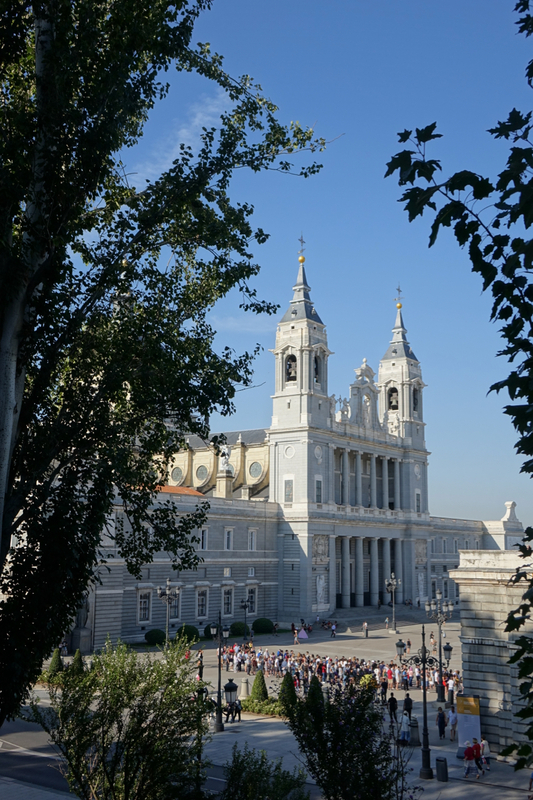 Cycling up a twisting cobbled street gave us a good view of Almudena Cathedral…. 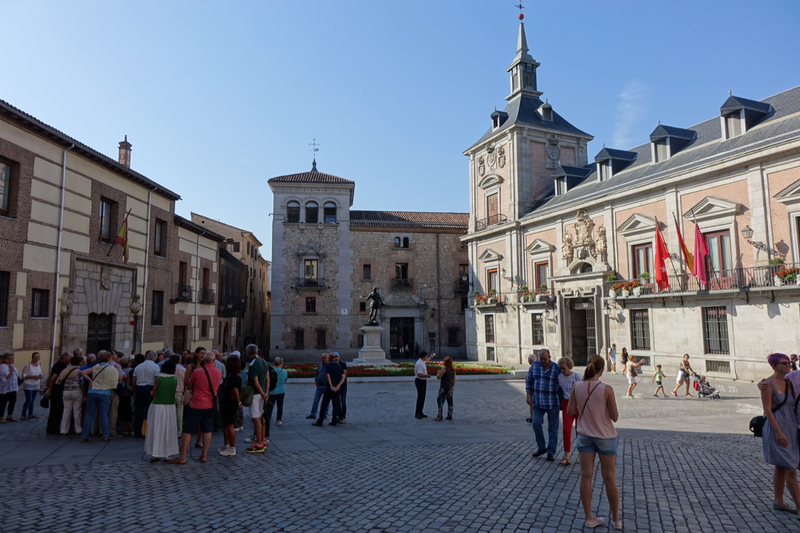 Then the next stop was Plaza de la Villa – where we saw the building that was the home of Madrid’s mayor from 1693 – 2007 (on the right below). Sebastien pointed out how the square had an unusual mix of Moorish and European style architecture. After that we came across what the Guinness Book of Records says is the oldest restaurant in the world. 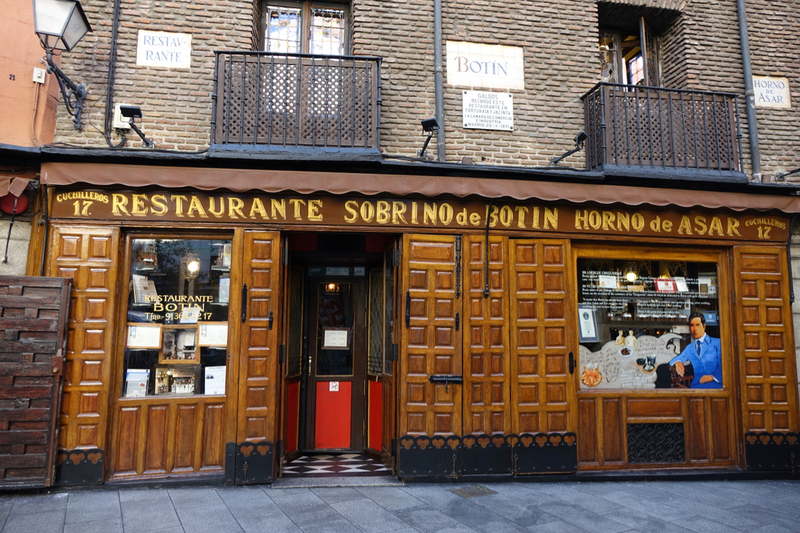 Situated on a small, hilly street is Restaurante Botín, which was opened in 1725, and which once employed a young artist Goya as a dishwasher. If that had got us thinking about food, Sebastien would soon have us covered. He’d started waving and speaking to everyone as we passed in to another district. After pointing out how he seemed to know everyone, he explained to me we’d reached his neighbourhood. 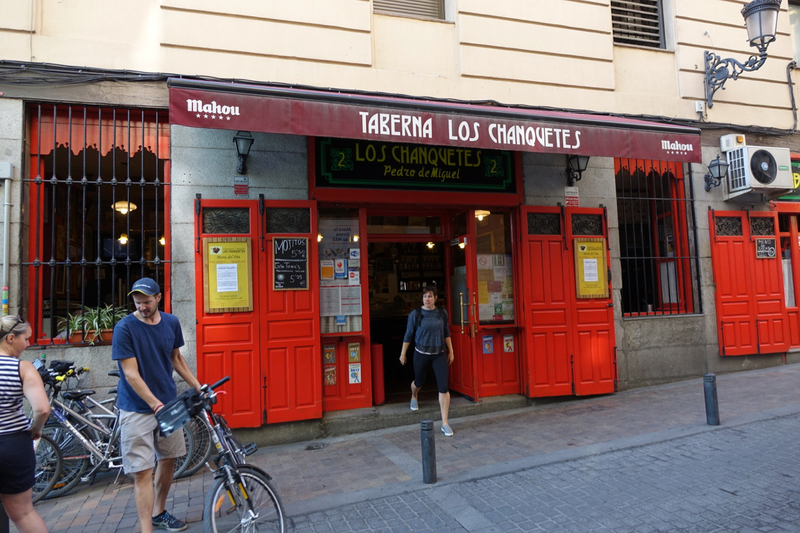 The place was buzzing with locals going about their day, and after a quick stop outside a market which also contained a flamenco studio, we parked up outside a bar called Los Chanquetes. and the head of a bull. We took a table by the bar, and Sebastien ordered us drinks (just a coffee for me!) and some snacks. The first was what we would probably call pork scratchings – but these were unlike any I’d had before! 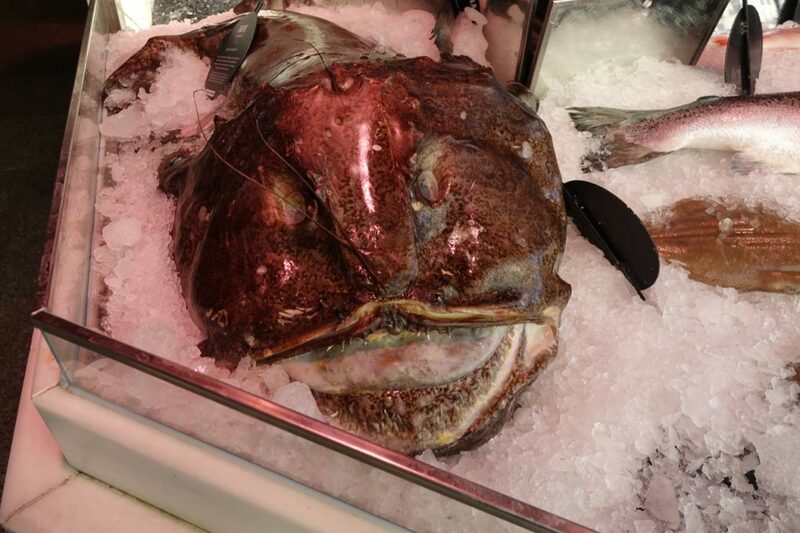 As well as being crunchy, they had big thick layers of meat (or maybe fat) attached to them. I had two and then thought I’d better call a stop there! The other dish ordered up was tortilla – which was comparable to the pintxos version I’d had the night before in Platea. I made a mental note to try and make one when I got back to the UK. We sat and chatted for a while, and then once Sebastien had settled the bill, we headed back outside to resume our tour. 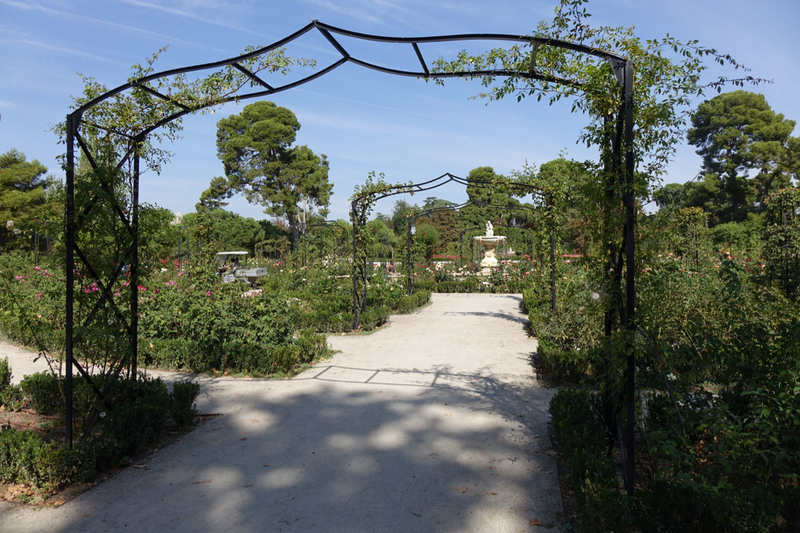 After navigating a scarily wide roundabout with fast-flowing traffic, we arrived at Parque del Buen Retiro – Madrid’s most famous park, the one which was just up the road from my hotel and which I’d passed by the night before. It’s a beautiful park – just look at this. Not a bad view! 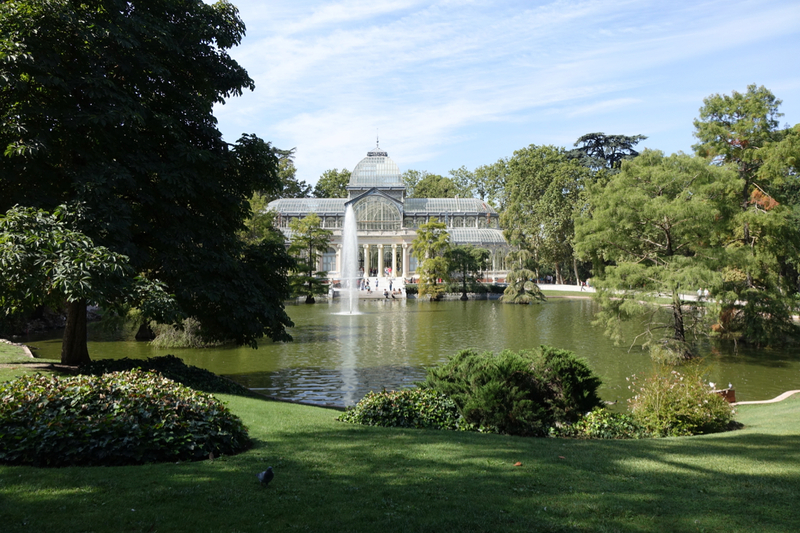 …we cycled to the park’s biggest landmark – the Palacio de Cristal or crystal palace. Dating back to 1887, it sits in front of a lake which is home to two black swans. I made a mental note to come back and have a closer look at it later on. Our last stop for the day was familiar to me – we headed into Recoletos and through the doors of a grocer, which brought us into Platea. As I’d been there just the night before, while Sebastien watched over the bikes outside, I explained the deal to the rest of the group and recommended they come back and try the food. By now it was around ten past one – we’d been cycling and exploring the city for more than three hours. Back at the Bravo Bike shop in the Argüelles district we parked up, and Sebastien drew our route on a map – and helpfully pointed out a couple of restaurants he recommended we visit. As well as tracking calories burned on my watch, I’d been tracking our location on my ‘phone so that I could location tag my photos later. Looking at our tracks, we’d done a great route right around the city. 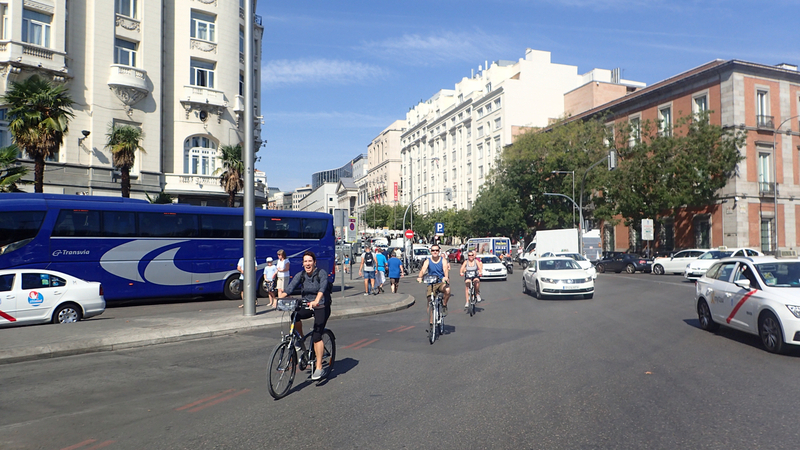 I’d definitely recommend Bravo Bike for a tour if you get to Madrid. We came across another bike tour several times when we stopped, and the number of people on it looked closer to twenty. I thought our smaller group meant we got a more personalised tour and tips from Sebastien. After we said our goodbyes, I wasn’t quite sure how to spend the afternoon! I nipped into a Carrefour to buy a drink and stood outside working out where I was. I decided to do a wander along Grand Vía, one of the city’s main shopping streets in the afternoon. And rather than get on the metro I decided to walk – with one end of the street only twenty five minutes away. Heading towards the centre of town I hadn’t got too far when my stomach made me begin to think about lunch. I looked around and saw I was standing outside a place that looked interesting. To me anyway! The burger in the window, it was fair, was probably what caught my attention. 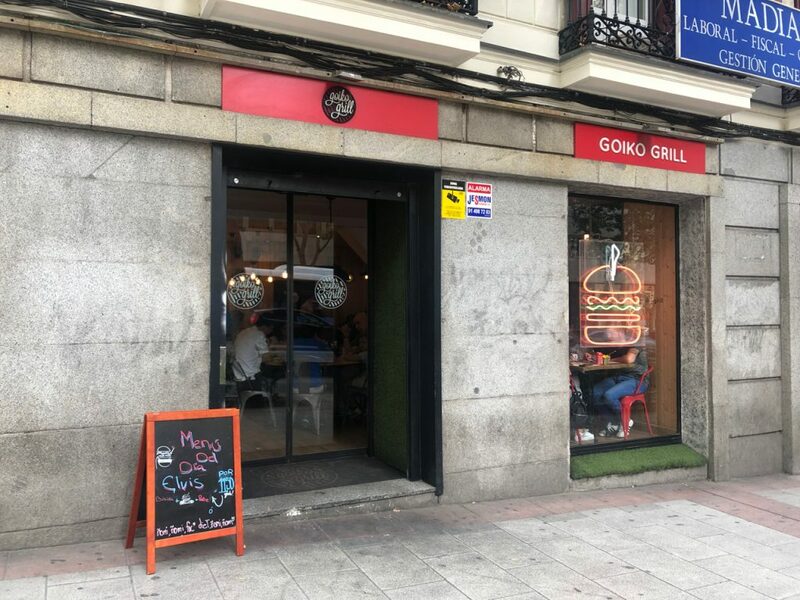 With a name like Goiko Grill, I wasn’t sure whether it was like a kebaberie or some fancy Argentinian style place, so I did a quick Google to check out reviews. 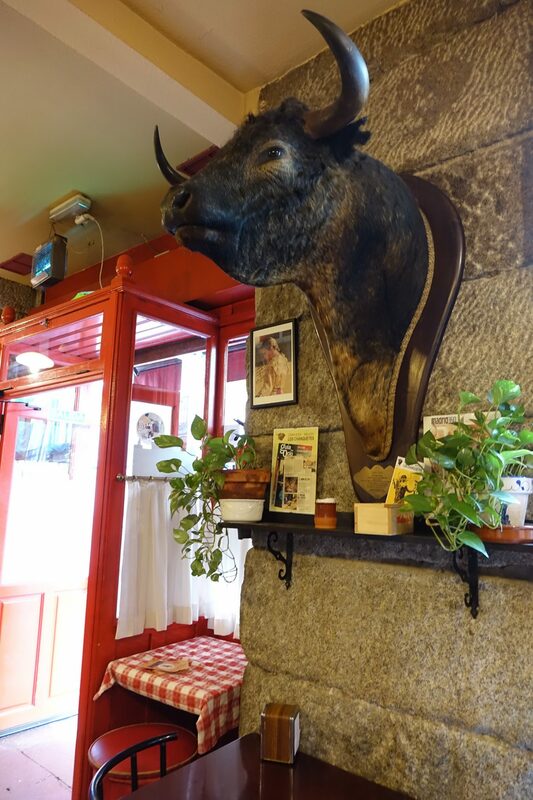 And the general consensus seemed to be that they offered some of Madrid’s best burgers. After spending probably longer than I should have standing chewing over whether to step inside or just head to McDonald’s, I decided on the former and walked in. Every table was filled, and I was asked whether or not I had a reservation. The place does seem to mainly operate with reservations – which seem easy to make through the chain’s website. 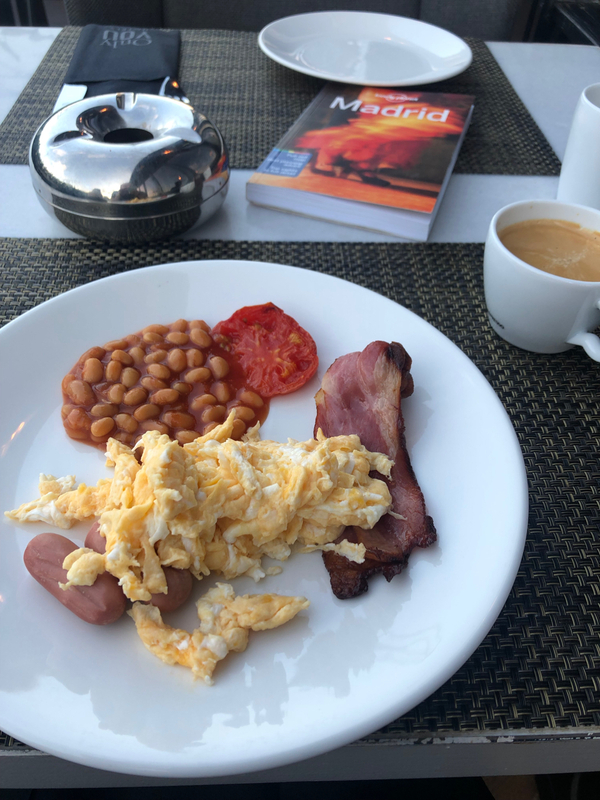 After explaining I didn’t have one, I was seated at the bar, which I didn’t mind – I’m fairly used to that when I’m travelling, being a solo diner. The menu was extensive and thankfully available in English. The only problem I had was that they all seemed absolutely enormous and I wasn’t actually that hungry. 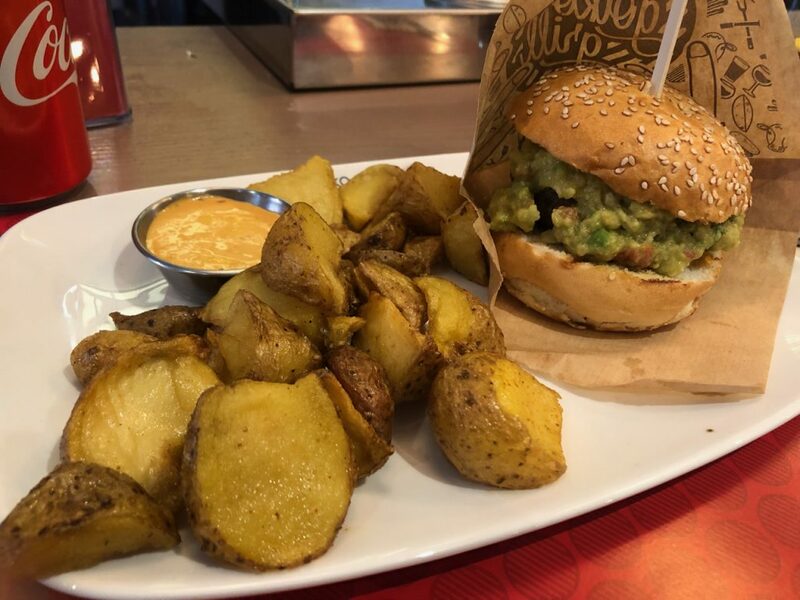 So in the end I decided to go for what looked like one of the smaller burgers – the Chipotle. Ten minutes later, it arrived. And it looked pretty big! But I was sure I’d manage to tuck it away (which of course I did). It was tasty, and the accompanying potatoes were delicious. My only slight grumble was that it was a bit too well cooked for me – but I think that was my fault. 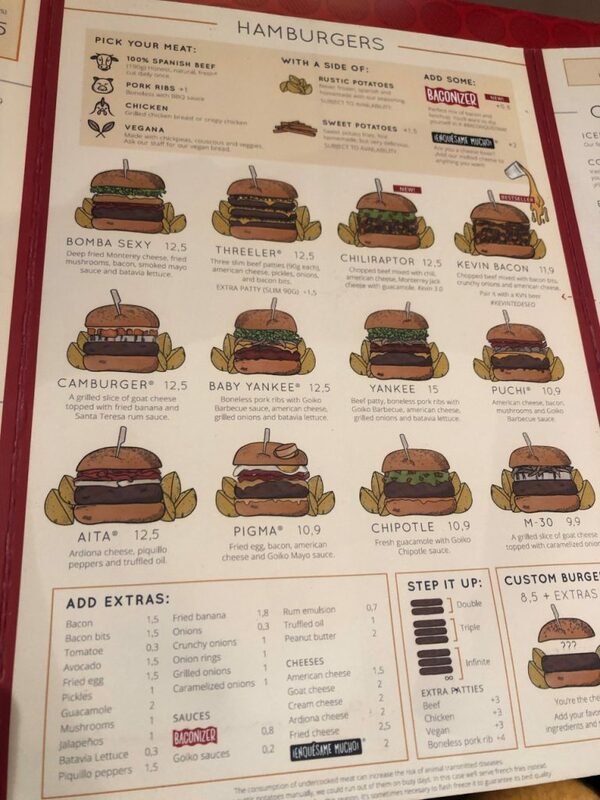 I’d asked for medium then changed my mind to medium-rare, but I think the waiter only caught my first instruction. After settling the bill which came to €13,40 including a drink (about £11.95) I stepped back outside and continued walking into town. But a branch of Carl’s Jr. as well, which I didn’t even know existed outside the US. I managed to resist both. 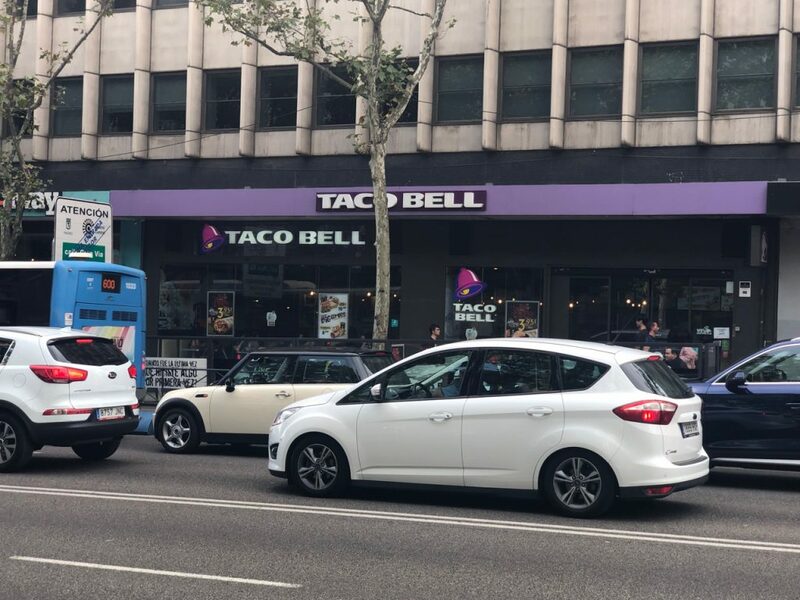 Soon I’d reached Gran Vía, and thought I’d just wander along the street popping into shops that took my interest. I spotted one straight away which looked a bit interesting, but could see around the back a building marked ‘mercado’. Thinking it might be a food market, I went and checked it out, but it seemed to be closed. Coming back down on to the main street I decided to step inside the shop I’d spotted a few minutes earlier, and with that fateful decision, bang went an hour and a half of my afternoon! 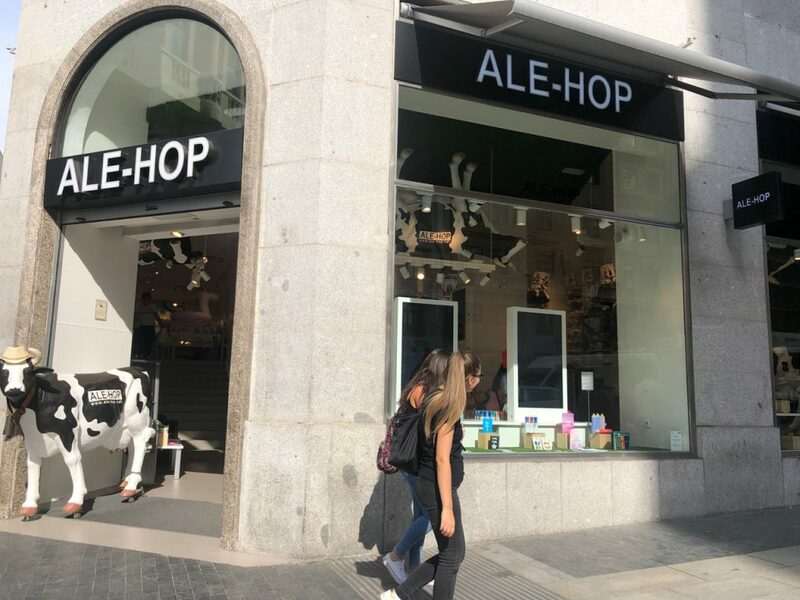 The shop was called Ale-Hop and is part of a Spanish chain which also has stores in Portugal. I’d never seen it before, but I think it’s pretty common in the two countries now. 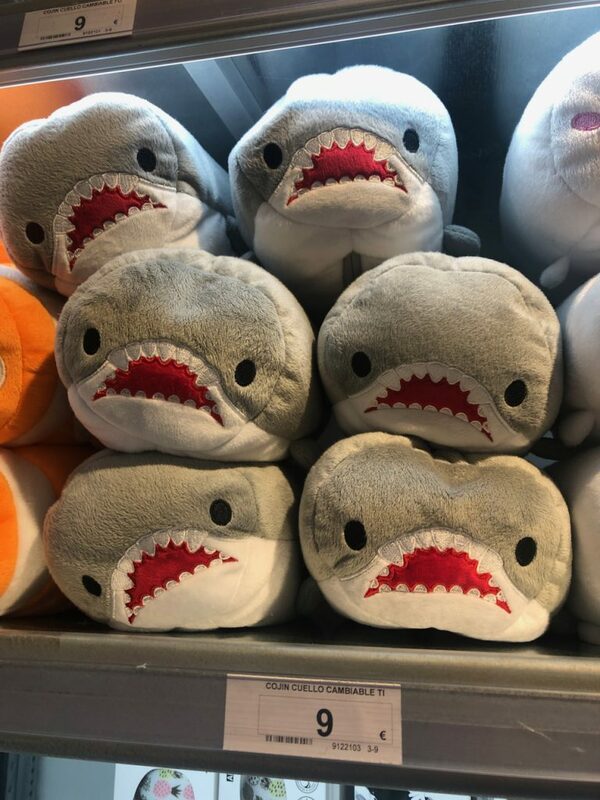 … and shark neck cushions (they unzipped). 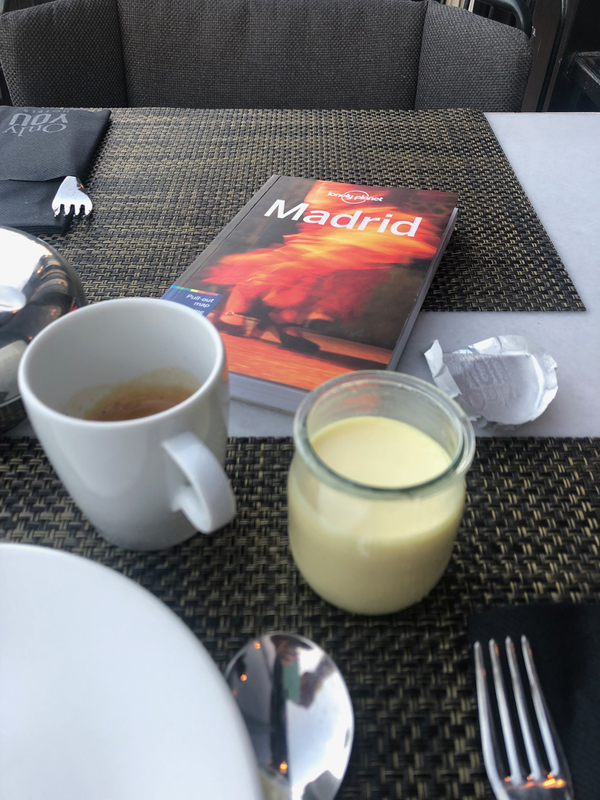 The time I’d spent in Ale-Hop had really sapped any energy I had for shopping, so I decided to call it quits on my exploration of Gran Vía, and head around the corner to Madrid’s Mercado de San Miguel. Just a short hop, skip and jump from Plaza Mayor, the market is, I’d say, definitely more aimed at tourists than locals. It was pretty busy when I stepped inside, and most of the voices I heard were non-Spanish. Hiya! And these caught my eye on the way back outside. They looked delicious, but it did just make me think how much food nowadays is made to deliberately look “Instagram-ready”. 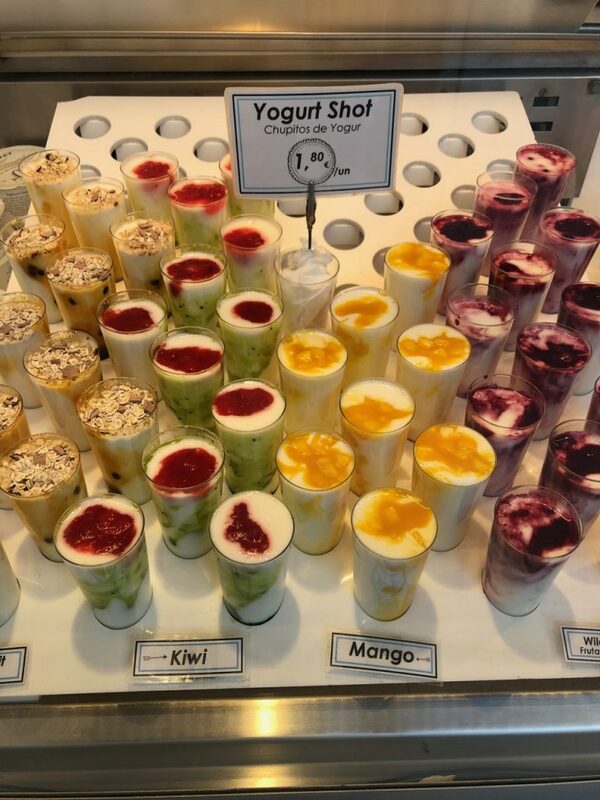 I passed on one of the yoghurt shots but did order a frozen yoghurt. 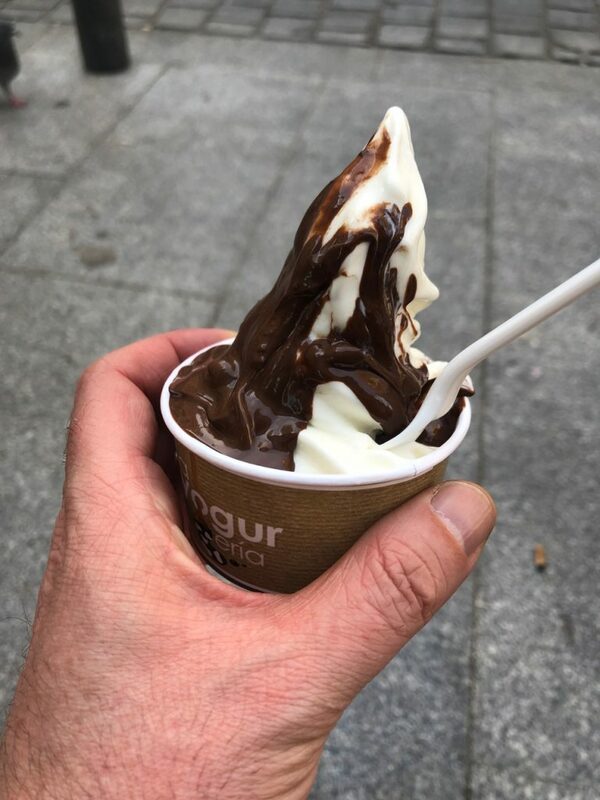 Unfortunately the machine seemed to suffer a random breakdown just after I placed my order, but eventually I was able to sit outside in the sun and tuck in. By now I was beginning to feel pretty exhausted, and I still had an appointment later in the day, so I headed back to my hotel and lay down for a snooze. Half an hour later my alarm went off. I literally dragged myself into the shower, and headed back out. If you’re a regular reader, you’ll know that often on my trips I’ll book myself in to a spa for a couple of hours just to chill out, relax my poor feet after a day’s exploring, and also just as a bit of a treat. 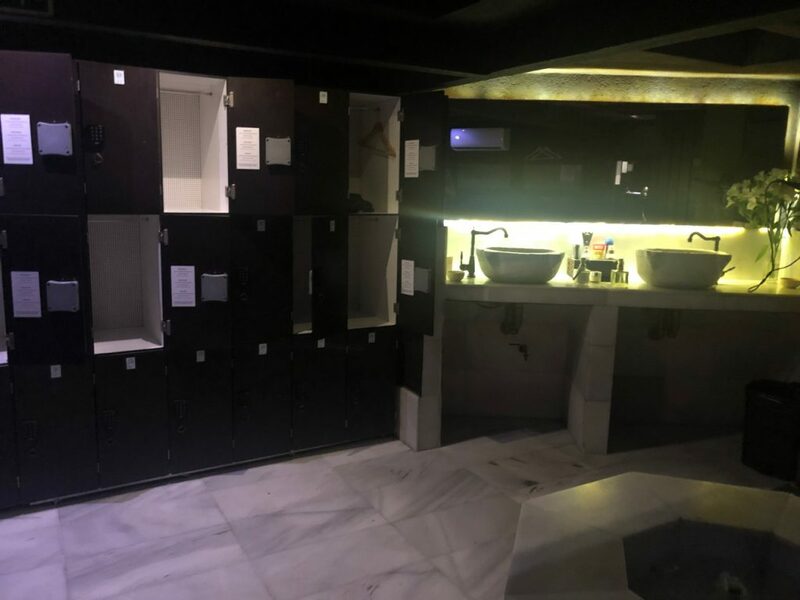 I’d done a bit of research on where I could visit in Madrid and settled on the Hammam Al Ándalus baths. 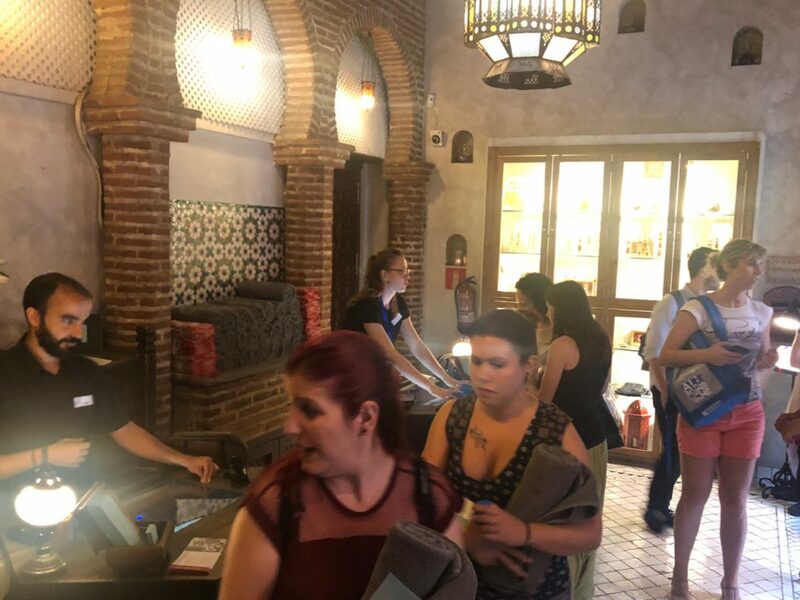 To be honest I had no idea what a Hammam bath is, but apparently it’s a type of public bathing associated with the Ottoman Empire that became popular in Western Europe during Victorian times. All I knew was that the pictures on the website looked like it should be pleasant and chilled out! I’d wanted to book a massage, but a week before my visit the only thing that had been available at 8pm had been a package which included use of the baths, a 30 minute massage and a ‘purification’ ritual on a hot stone bed. I had no idea what that meant, but I booked it anyway. The baths were just a 20 minute ride on the metro away from my hotel, so I was there in plenty of time for my appointment. Stepping inside to the small reception, I was surprised how busy it was – apologies for the terrible photo, I was trying to be a bit subtle! It seemed like everyone was taken in to the baths at one time slot which I guess made sense. People sat and waited until someone came and collected them en masse and took them into the baths. As I was the only English speaking person there, I had to wait for an English speaking attendant. Soon he arrived, and took me through an ornately decorated wooden door. Obviously getting photos inside the baths wasn’t really possible, but I did try and get some to show you what it’s like! This is the corridor we walked down after leaving reception. 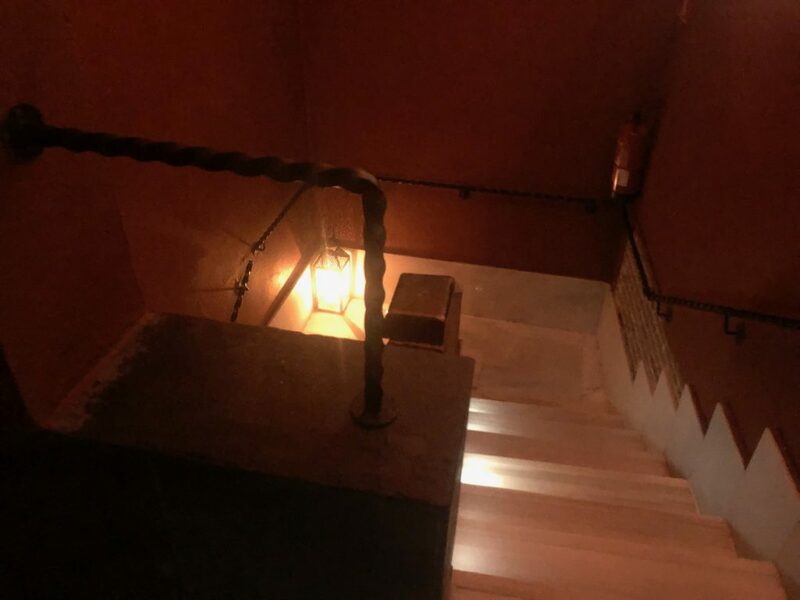 My ‘host’ explained how everything would work – after getting changed into my swimming costume, I’d head downstairs where I could enjoy one of three baths – a warm one, a medium temperature one and a cold one (which was more like a plunge pool). I was given a wristband and told that an attendant would call me when it was time for my treatment. He also explained that when a bell rang, that would indicate my time in the baths was nearly up, but his accent was so thick I couldn’t catch how much time we’d have before the second ringing of the bell meant it was time to leave. I did ask twice, still didn’t catch it and was too embarrassed to ask again! …put my stuff in a locker, got changed and headed downstairs to the baths…. Stepping through a door an attendant pointed me towards some showers – a good thing I thought. Until I spotted one woman deliberately swerve having one – like that’s just unhygenic! After checking out the layout, I went and sat in the warmer bath for a while and just chilled out. I was glad I’d booked the experience for the same day as my bike tour, as I felt it would soothe my surely soon-to-be-aching muscles. After about maybe fifteen minutes, a man asked me to raise my arm and show him my wristband, then beckoned for me to follow him. I grabbed my towel and headed into a waiting room where he asked me to select an essential oil for my massage. I chose red amber as it kinda smelled ok and apparently helps you chill out. After standing around for a bit, I was called through into a room and told to lie on a warm stone slab. This was the ‘purification’ part of the treatment. Now hands up, I didn’t really know what to expect at this point. I had thought this was going to be a hot stone treatment, and thought that involved hot stones being placed on your back, but I had obviously misread the description and got it wrong! As I lay there with my eyes closed, warm water was poured all over me. At the exact point it started happening my instant reaction was that that was worth the money alone. I didn’t care if that was all that happened for the next 45 minutes. It was sooooo relaxing and felt that good! The water pouring did come to an end though, and next I heard a gentle ‘scoosh’ing sound and felt foam slowly cover me. Then rough-gloved hands started scrubbing me down. It was not an unpleasant experience – and I thought probably the best wash I’ve had in ages! After turning over and having the whole experience repeated on my back, shoulders and the back of my legs, to be honest I was ready just to go and lie down and fall asleep. But I was led up some stairs into another room – it was time for my massage. I was asked if there was an area I wanted the massage to concentrate on but I couldn’t really make out the options, so I just said ‘back’. I lay down on the table, and the massage began. I thought it was actually a pretty gentle massage, until the guy started really pushing down on my shoulders. That part was slightly painful! After 30 minutes, my massage was over, and I was handed a little cloth in a bag. I’m still not sure what it actually is or what it’s for. What I did know however was that I felt completely relaxed, and very ‘clean’ – that’s the only way I can describe it! After drinking some hot, sweet tea out of a tap, I climbed back into the baths and soaked for a while as I listened to some ‘wailing-type’ music. After visiting all three of the different temperature baths, I was just beginning to wonder what to do next when the first bell rang throughout the area. Deciding I was ready to leave anyway, I headed back up to the changing rooms, took a quick shower, and after changing, headed back downstairs. 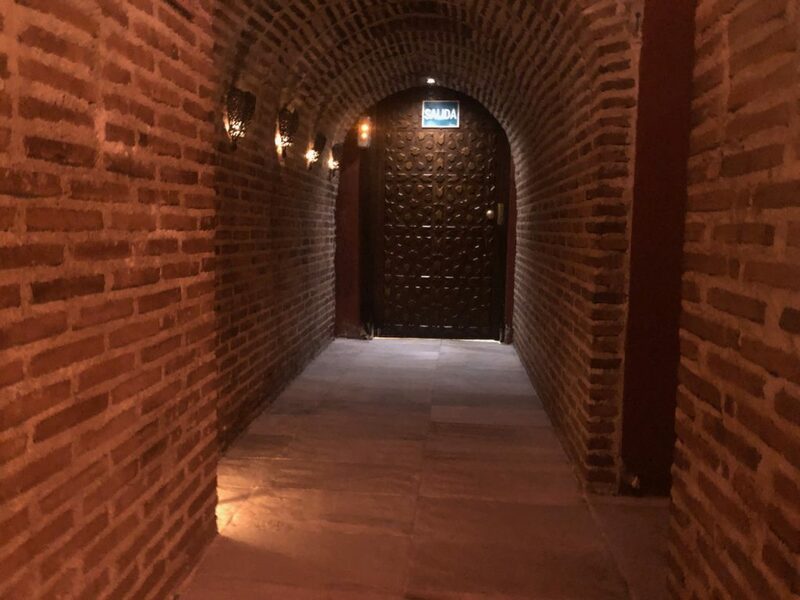 So was my trip to Hammam Al Ándalus worth the nearly €100 it cost? Overall I’ve got to say the treatment was worth it. And the baths were a pleasant place to spend some time, although they were perhaps just a bit more basic than I’d imagined. There aren’t many frills, and I wouldn’t really call them luxurious, but it was a relaxing experience. If you plan to go, I’d definitely check out the treatments available as I think just a trip to the baths themselves may be a slight disappointment. I was glad I’d gone though. Over the next couple of days I saw lots of advertisements for the baths on Madrid’s metro. 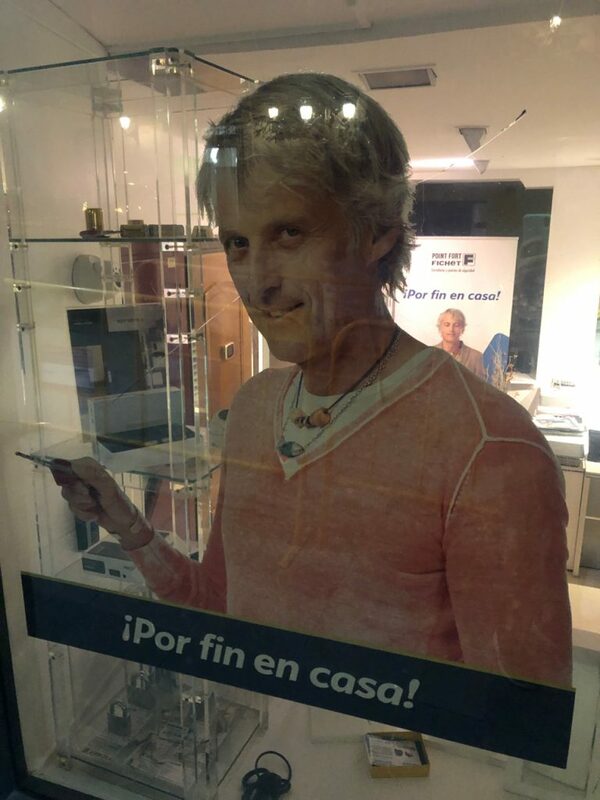 The same company also has baths in other Spanish cities. By now it was about ten to ten, but stepping back out on to the street, it seemed like Madrid was just beginning to come alive. 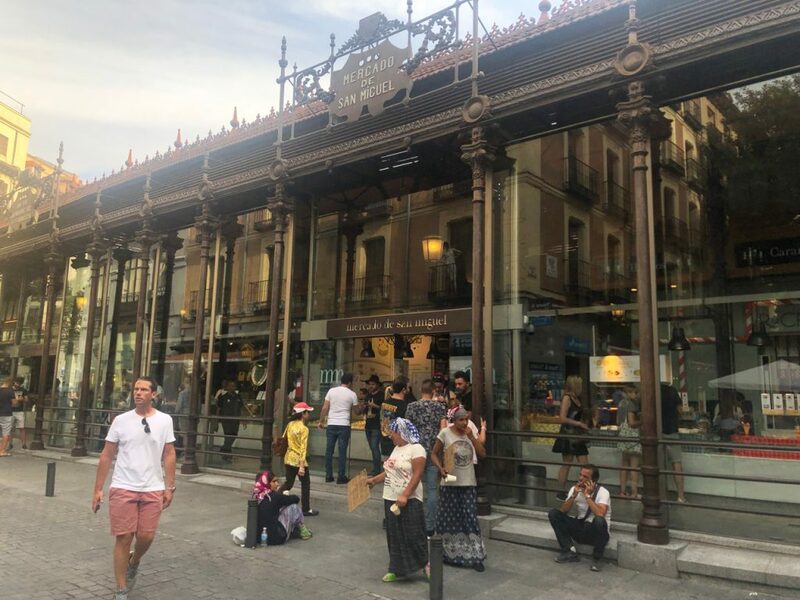 I’d been planning on just heading back to my hotel after my trip to the baths, but there was such a buzz in Plaza de Jacinto Benavente, just up the street from the baths that I decided to soak up the atmosphere for a while. Wandering around, it seemed like half the city had come out for dinner in the square which was surrounded my restaurants, small streets and theatres. 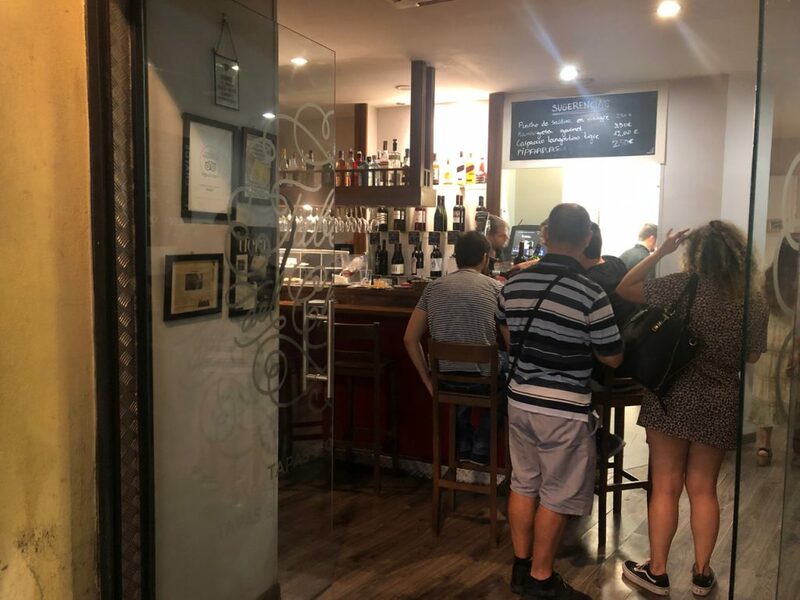 While I wasn’t too hungry, I decided that’s exactly what tapas was for – a little bite to stave off hunger, so I decided to check out which tapas bars were nearby. Foursquare quickly pointed me in the direction of one that was only a minute away. 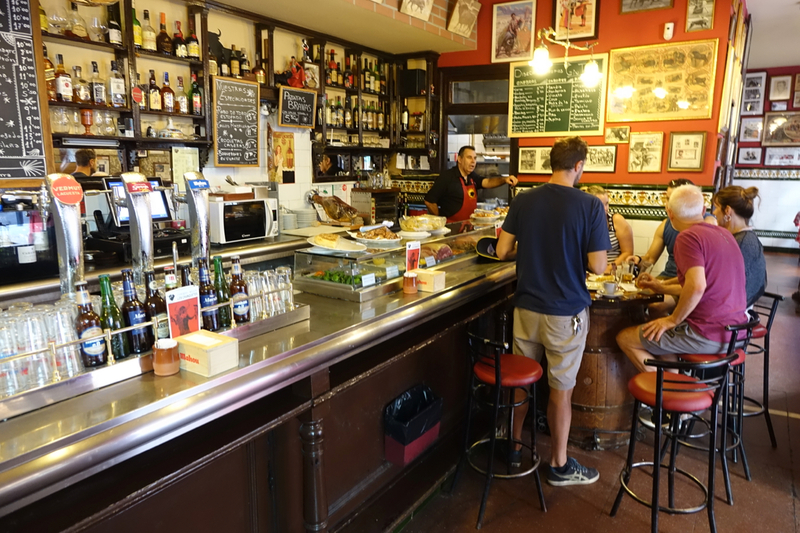 After navigating my way to Taberna del Chato, I stepped inside and took a seat at the small bar. 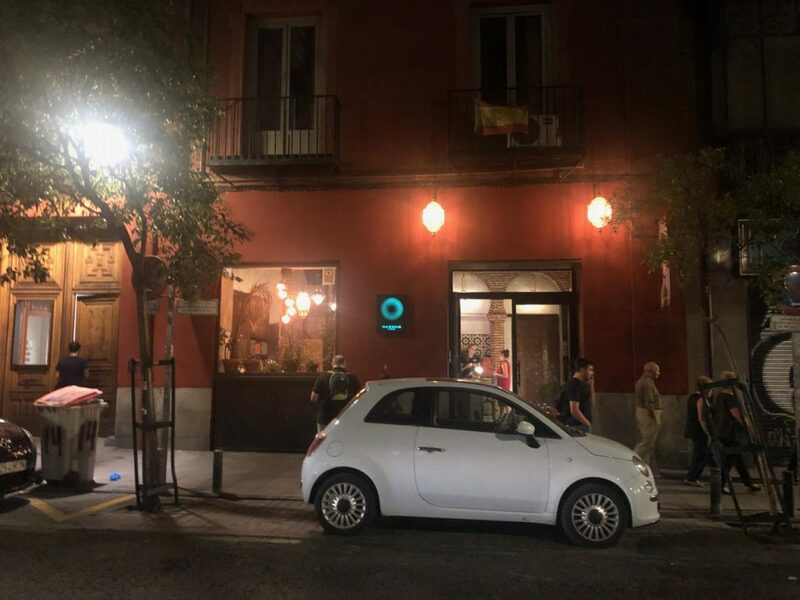 A quick google brought me to a site with a review of the spot by a Spanish blogger and food tour operator. Reading it reassured me that I’d chosen a good spot. Apparently the bar had opened fairly recently and created a buzz in the city with its concept for tapas. Perusing the menu (again thankfully available in English) I chose a couple of dishes from the friendly staff, and ordered a Coca Light to go with my meal. A short while later, my three chosen dishes arrived. And all were absolutely delicious. That wasn’t surprising though that two of my favourite foods were involved! 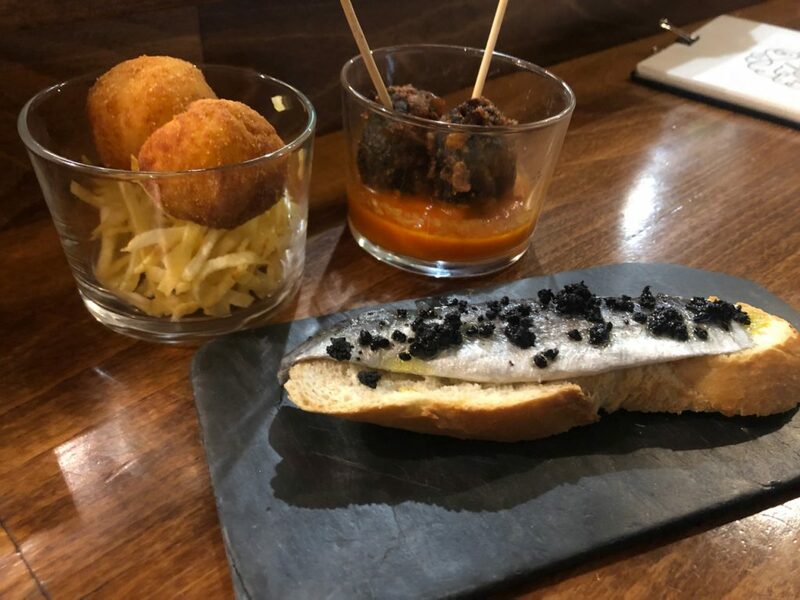 With two of them served in small chato glasses (used for wine in Northern Spain) I had (from left to right) ham croquettes, black pudding in a tomato sauce, and sardine on bread. They were simple dishes, but absolutely perfectly executed – to me anyway. I loved them – particularly the meaty tasting black pudding. 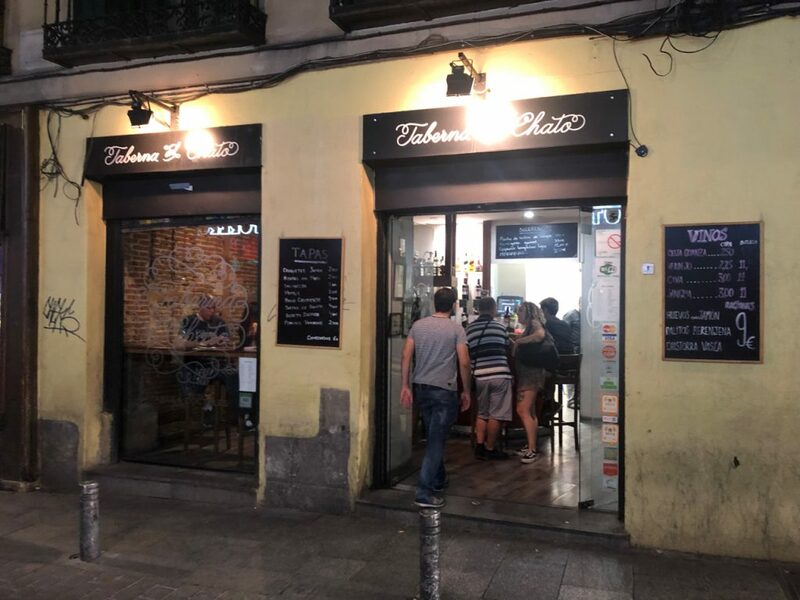 The bill came to a very reasonable €9,50 – if you’re in town, I’d definitely recommend Taberna del Chato. It’s misleadingly small from the outside too – with more tables and space through the back. Eventually I made it out of there, and wandered back to the hotel. 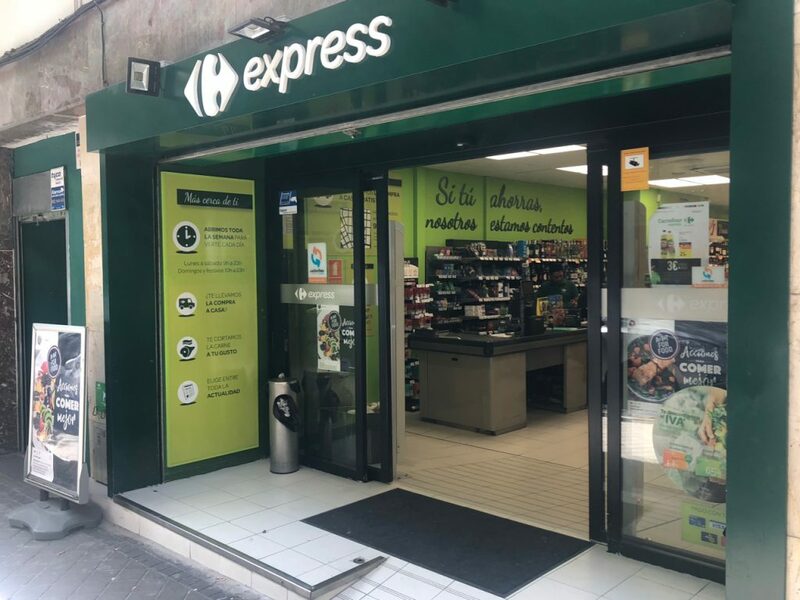 While I took the more direct route, which reception staff had told me was a bit dull and commercial, I took my time looking at the buildings and shops lining the streets. 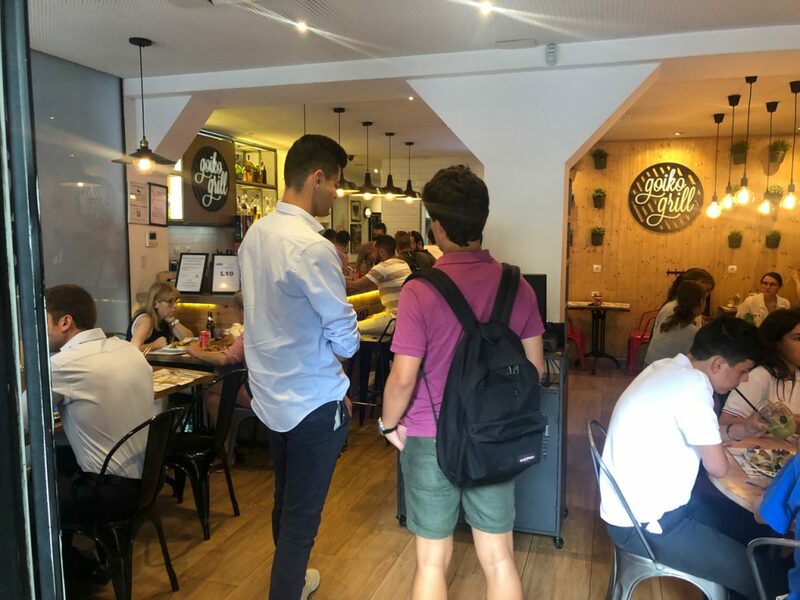 Madrid is packed full of tiny stores, bars and restaurants – something I feel like we’re missing at home really as more and more chain places open up. 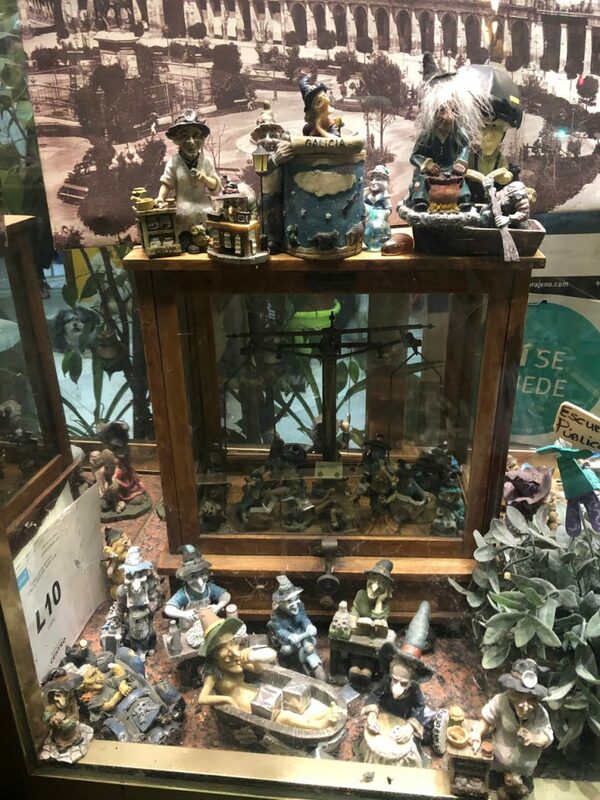 What fascinated me though was some of the just completely random displays in shop windows – something I’ve noticed in a couple of cities I’ve visited throughout Europe and Scandinavia. 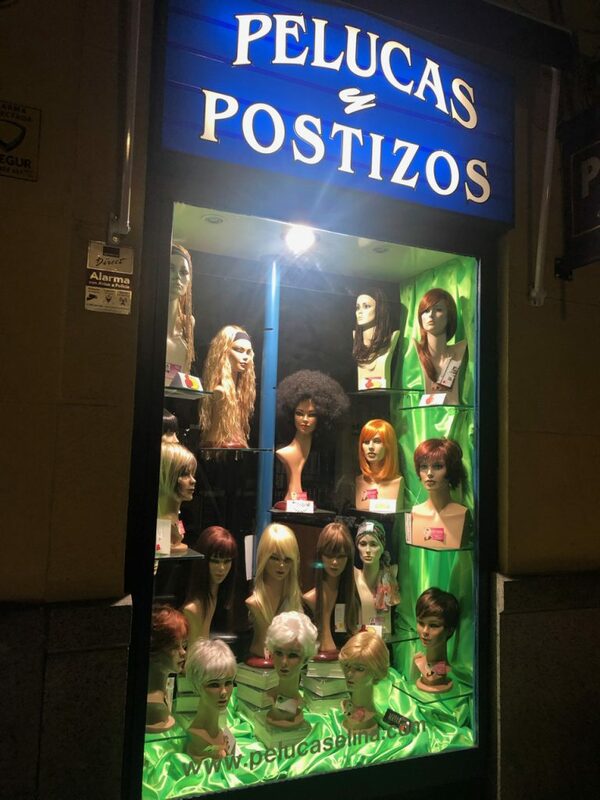 I liked this wig shop display…. 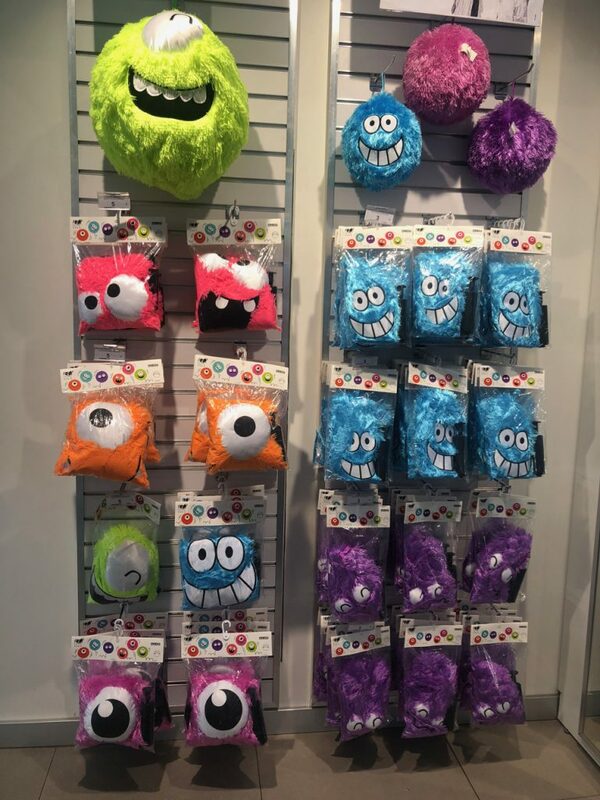 Just ever so slightly creepy right? 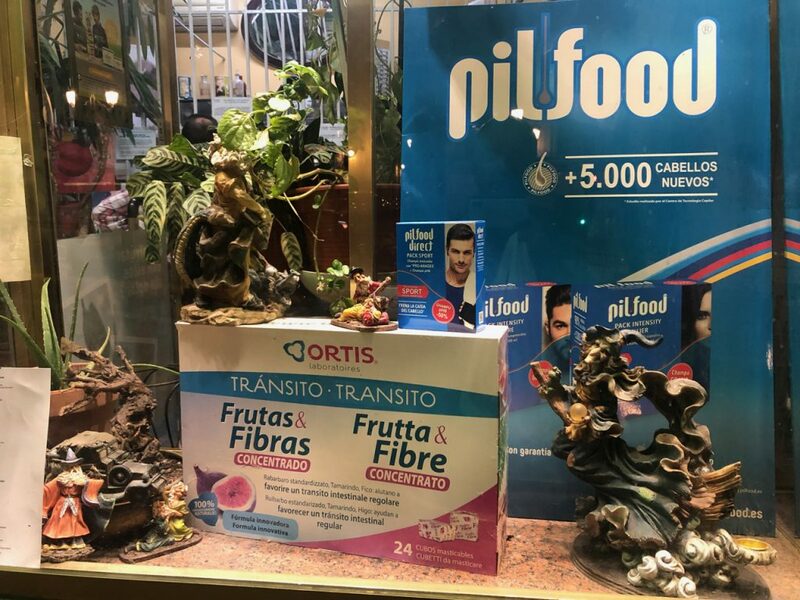 As was the window dressing of a pharmacy which was still filled with a smattering of customers even though it was approaching eleven o’clock. There was definitely some wizard theme going on there which I didn’t really get. A couple of buildings away this guy appeared – I’m not quite sure what he was advertising. By the time I got back to my room it was eleven o’clock. 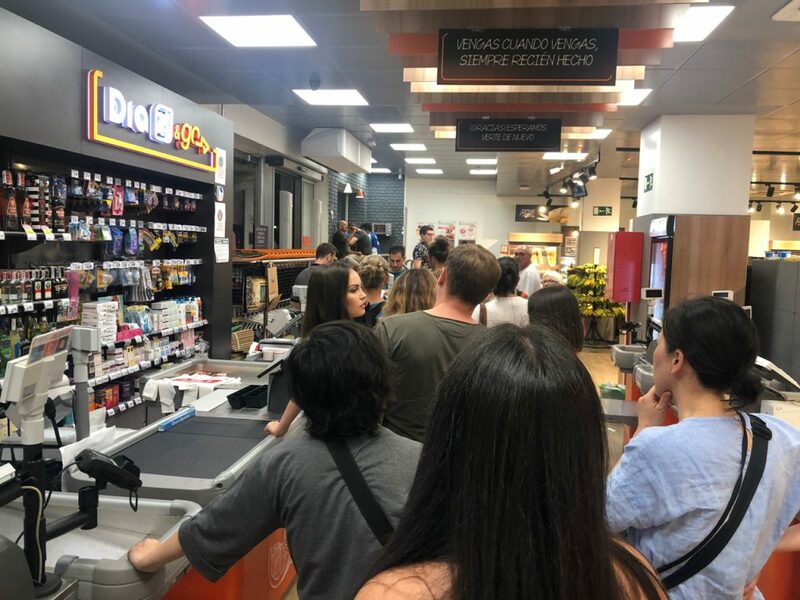 It had been a really long day – but I felt I’d really begun to get beneath the surface of Spain’s capital city.